The sun is shining, but morning air is brisk, beach days no longer involve bikinis --and the snowbirds are heading into town! This only means one thing; summer has officially left the building and fall has come in swinging here in Florida. The change of seasons brings the emergence of sweaters from the attic; fall cooking recipes, but most importantly, fall decorations to beautify your home. 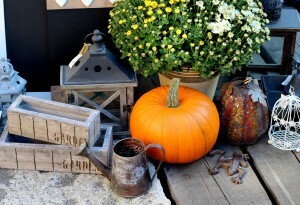 If you are bored, want something simple to afford, then welcome aboard to decorating with a gourd! Garnishing your front porch or tabletops with gourds, cornhusks, and other fall vegetables is a simple, yet refreshing new look to add to your interior design! Harvest decorations can work particularly well in your dining room. For example, if you are having company over, use mini pumpkins as place settings to add flare and color to your dining room table. If you are more into color, try decorating with popular fall colors, such as browns, greens, and oranges. Using these colors upon a white or neutral backgrounds will make the fall colors pop as brilliantly as the fall foliage. Finally, nothing says fall like a set of spooky decorations for Halloween. But this fall, try to mix it up a bit by creating some pumpkin chic and trading the traditional jack-o-lantern for modern stripes or scallops. Head over to our new Fall Pinterest board to see examples of some these ‘beautifall’ design tips. We leave you with these tips, so remember: do not fall behind, and get to decorating your home for the new season. For more information on Providence Homes visit our website at ProvidenceHomesInc.com. Providence Homes is Jacksonville, Florida’s hometown builder. As one of the area’s largest locally owned home builders, we are committed to building beautifully designed, 100% Energy Star certified homes at an affordable price. No matter which neighborhood you choose in Clay, Duval, or St. Johns County, Providence Homes has been a name families can trust as a Jacksonville new home builder for more than 20 years. Visit providencehomesinc.com for more information.